I can’t find my award for ‘Best Broadcast 1995’. I wanted to show a picture of it just prove that I’d won it. ‘Best Broadcast on the Subject of Caravanning’, awarded by the Caravan Club. Actually I think it was the only broadcast on the subject of caravanning in 1995, the 100th anniversary of the mobile home first being used for recreation. We were lent a motorhome as we made the BBC Radio 2 programme and drove up to Norfolk to attend the Caravan Club annual rally at Holkham Hall. We loved sitting majestically above the other traffic in the M11 jam. I’ve always looked on enviously at motorhomes swanning onto the campsite, hooking-up and opening a bottle while I struggled with the confusion of tent-poles and bents pegs. 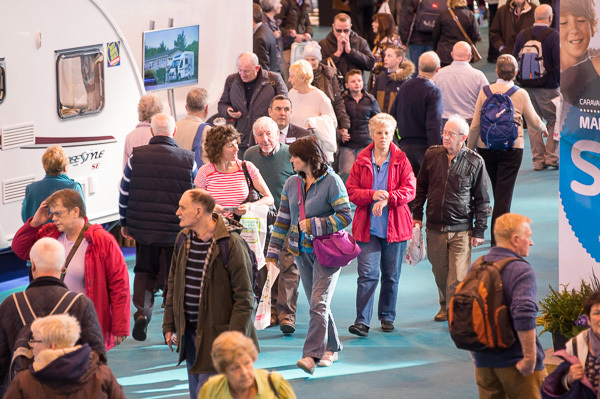 The National Exhibiton Centre in Birmingham is staging the Caravan, Camping and Motorhome Show 2015 this week (17-22 February) so it seems like a good chance to compare the three means of access to what the show catalogue calls ‘the great outdoors’. 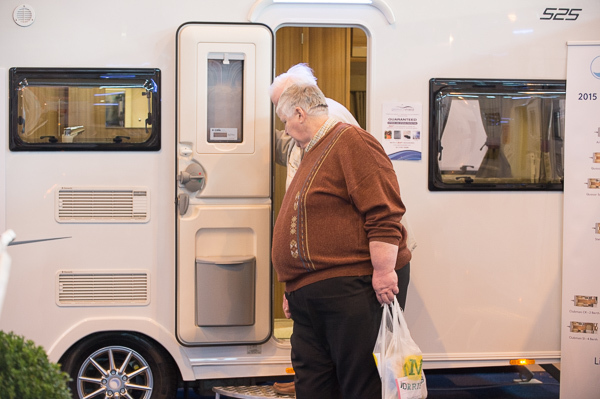 Walking into Hall 4 at the NEC and as far as the eye could see were motorhomes, big and small, some sleek, some bulbous, some with flip-up tops but all full of holiday promise and lovely soft-furnishings. Just as I’ve never towed a caravan on the road, neither have I ever driven anything bigger than a Transit van, but I was here to imagine what it might be like to have either one of these homes-from-home. So I went in search of the most luxurious motorhome I could find. 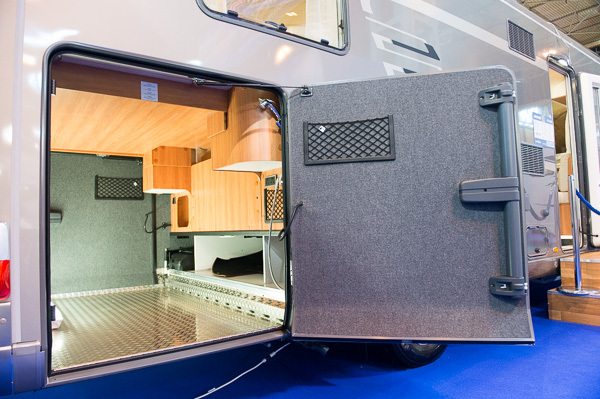 This turned into ‘most expensive’ and I got to £124,810 for a giant 6-wheeled Hymer. Sadly I wasn’t allowed in, probably they can spot those who can only ever dream! With my sights lowered I moved onto the ‘Brownhills’ stand, a dealer from Newark in Nottinghamshire. Their long stock list offered enough berths to solve the housing crisis. I liked the smaller vehicles the best, but I could just imagine arriving at a site, getting settled, then realising we’d forgotten to get milk and having to pack everything away. I asked some people looking at caravans if they would consider camping in a tent and they laughed. “With a caravan you’ve got everything there you could need.” There seems to be a bit of a hierarchy. “And if you’re in a tent and you get bad weather your holiday’s ruined.” I admitted that I’d never towed and didn’t fancy it. They insisted you soon got the hang of it, and then pointed me outside to the free ‘towing experience’ being run by the Caravan and Camping Club. hardly, I mean not a scratch on it! I couldn’t resist and they’d been lent some nice Volvos. Once they’d inspected my driving licence and rung up the DVLC to check it was clean I was introduced to George, my instructor. George invited me to look down the side of the car and to take in just how much wider the van was. He explained that while you turn later when you’re towing, you signal and then brake sooner. I realised that the combination of car and caravan are quite substantial and I’d better concentrate. We trundled around the NEC roads and out onto the motorway. I was very aware of how I was driving, for once not on autopilot. Twenty minutes later, with no incidents I thanked George and returned to the exhibition hall. I’d seen caravans and motorhomes, but so far no camping. I found it down some steps tucked away in one one of the smaller halls. I asked salesperson Alan if camping was just for the poor people. His eyebrows raised at the suggestion. “With camping you can just throw everything into the car and you’re away.” I pointed out you can do that with a caravan and motorhome. “Well you can, but you can’t take a van onto the sort of places I like to camp.” He has a point, but I’ve hiked and camped; it was hard work. “I just don’t like towing, and I can’t afford a motorhome.” He added. Much as I tried to stir it up between the caravaners, motor-homers and campers they all remained respectful of other people’s choices. “It just depends on who you are and what you want to do.” They all have at least one thing in common, a love of ‘the great outdoors’. 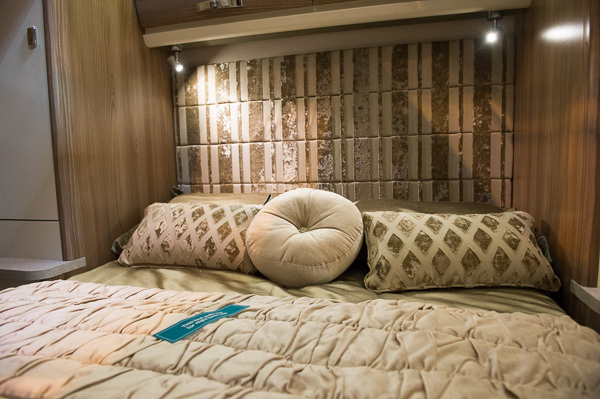 And those who love their caravans and motorhomes also seem to share a love of wood veneer. 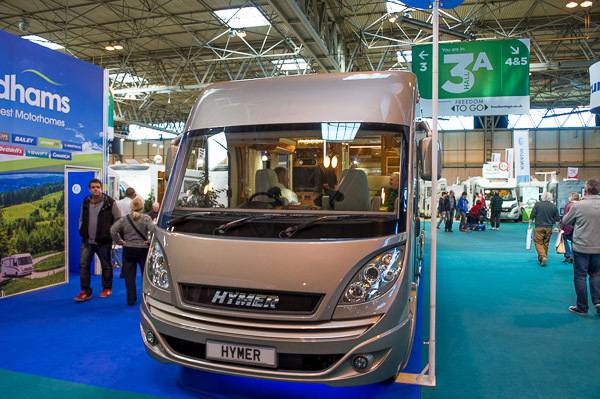 This entry was posted in camping, caravan, caravanning, driving, holiday, motorhome, National Exhibition Centre, nec.